Home » Brooms » The show must go on! In the last post, I told you how the big Arkansas Craft Show Christmas Showcase was cancelled due to nasty Winter storm that pretty much shut down the state of Arkansas. Then I told you how Jeanette and I went online to make things right with our budgets – I mean, as crafts people, we were counting on the sales from that show as a big chunk of our Winter income. 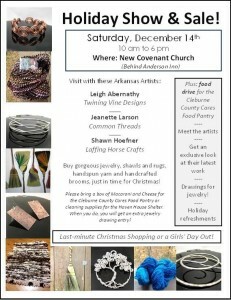 While we were doing that, Leigh Abernathy, friend and fellow artisan (she makes some wonderful jewelry including shawl pins that work great with Jeanette’s shawls) was busy setting up another, smaller brick-and-mortar show. 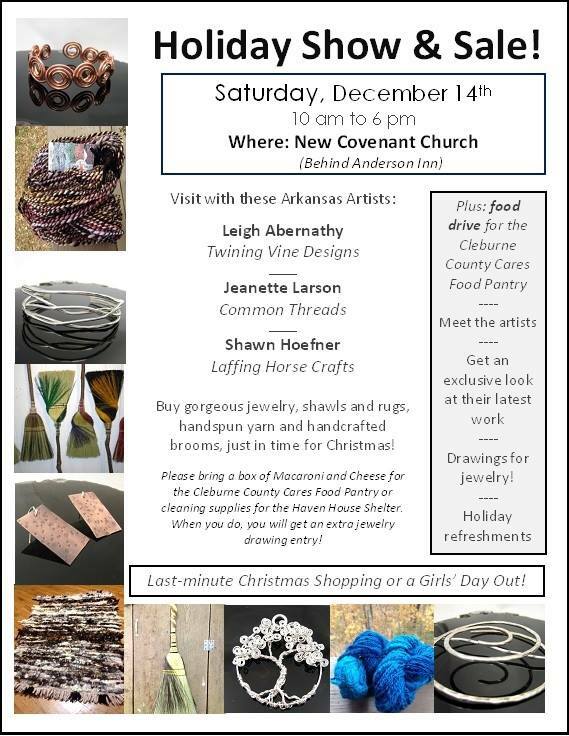 Join us for a little bitty big craft show in Heber Springs, AR at the New Covenant Church (behind Anderson Inn) from 10 am to 6 pm Saturday, December 14! And if you’re feeling a little Scroogish or Grinch-like, this is also a food drive!